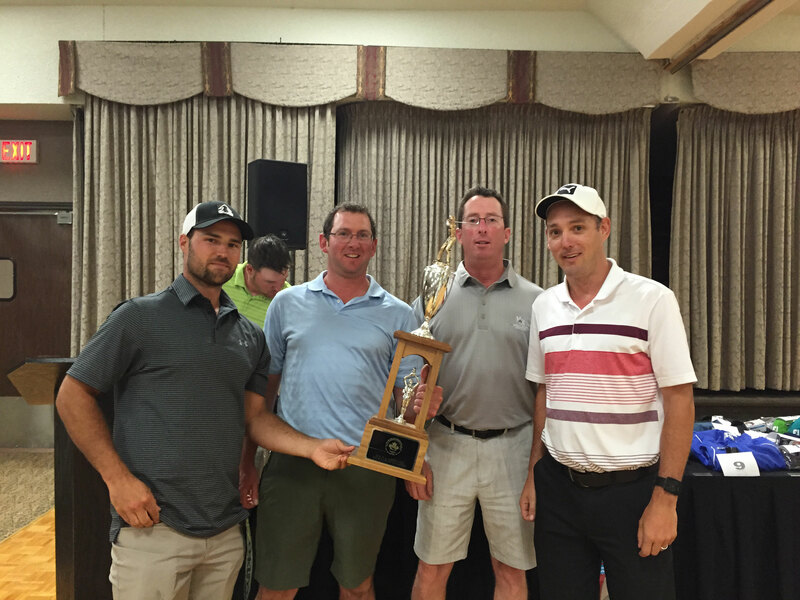 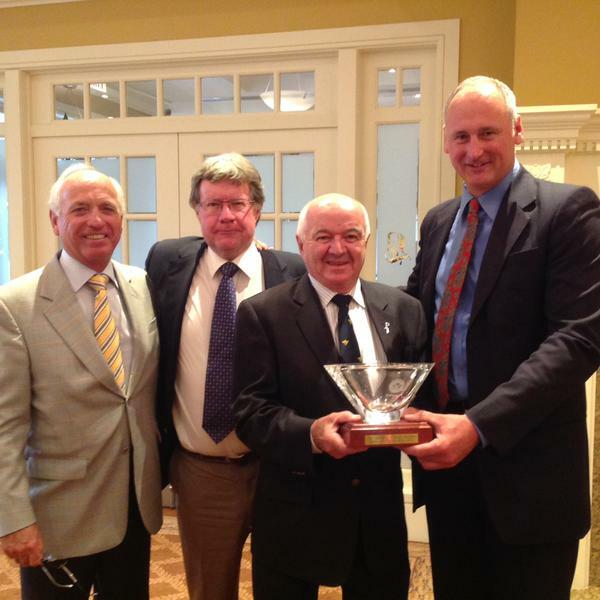 (L-R) Greg Brown presents the Paul G. Brown Memborial trophy to Jeremy Hubbard & Jason Finch (Cobble Beach GL), Darren Fritz (Kincardine GC) & Gary Tate (Plant Products). 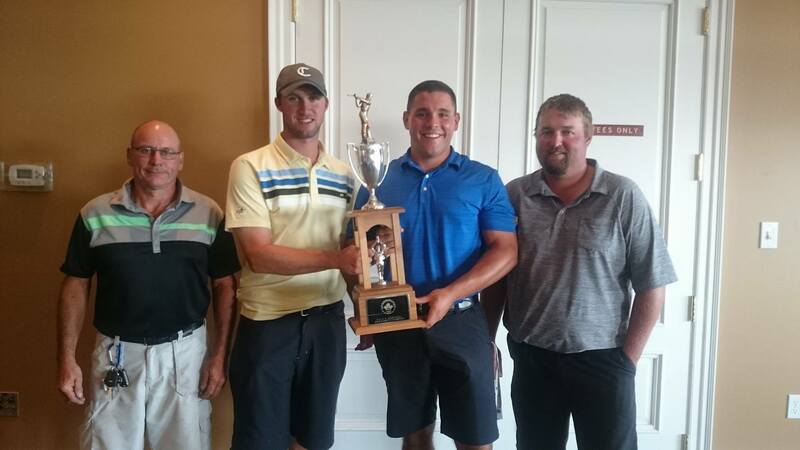 Owen Russell (centre) presents the Bill Bowen trophy to 1st place winners Marin Mitchell (left) and Brad Bell (right). 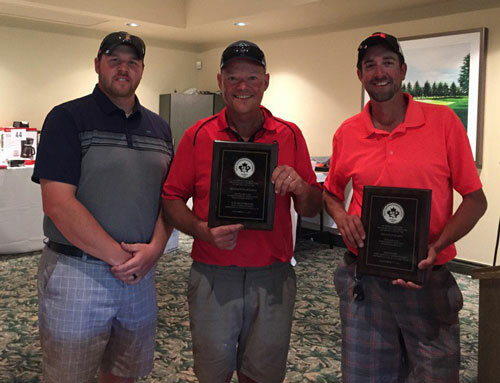 Ken Tilt, Assistant Superintendent from Trafalgar Golf & Country Club (left) presents plaques to Ray Dlugokecki, host Superintendent (centre), and Ryan Judd, host Assistant Superintendent, for hosting a successful event at Springfield Golf & Country Club. 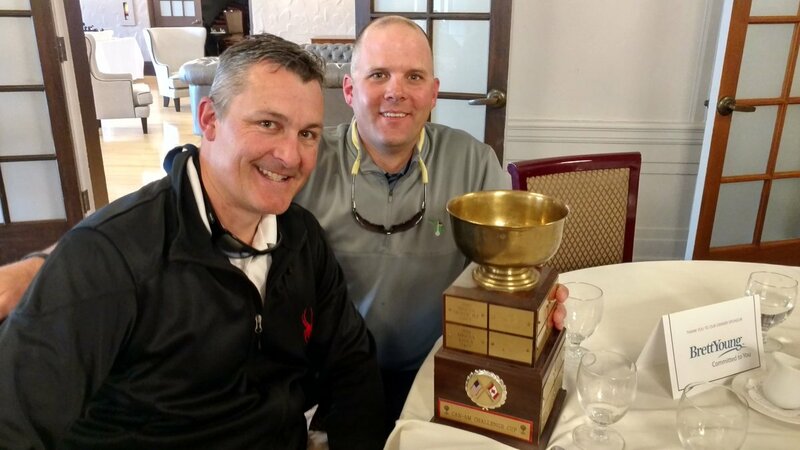 1st place team consisting of Rob Lewis, Deer Creek Golf & Banquet Facility, Gerry Fox, Dalewood GC, Ben Collins, Glen Cedars GC, and Shaemos Campbell, Pheasant Run GC, received the Paul G. Brown Memorial Trophy from Greg Brown, Assistant Superintendent, Essex G&CC. 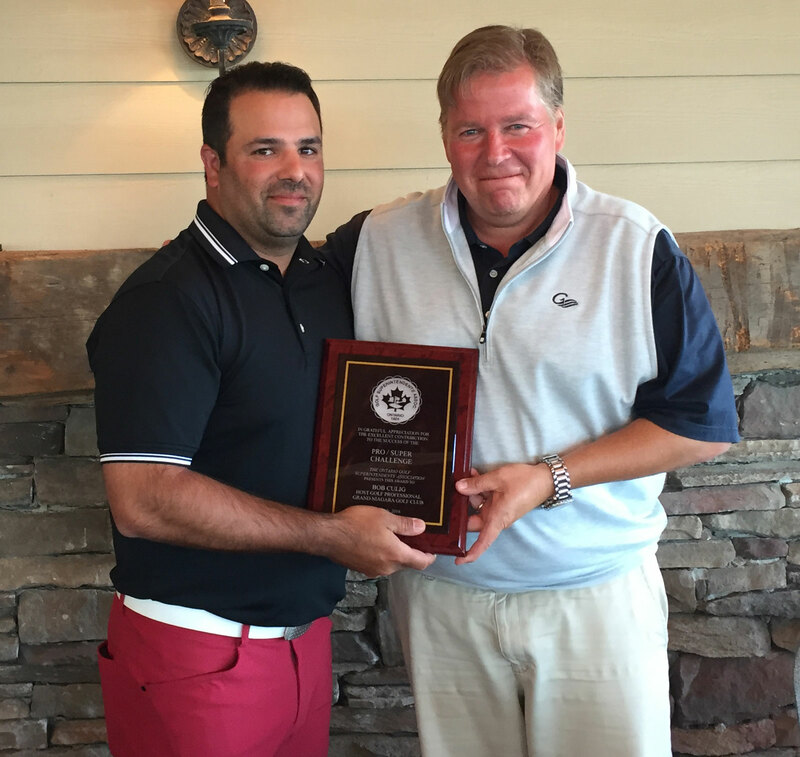 Scott Brook (Superintendent) receives, a plaque for hosting the Pro/Super Challenge. 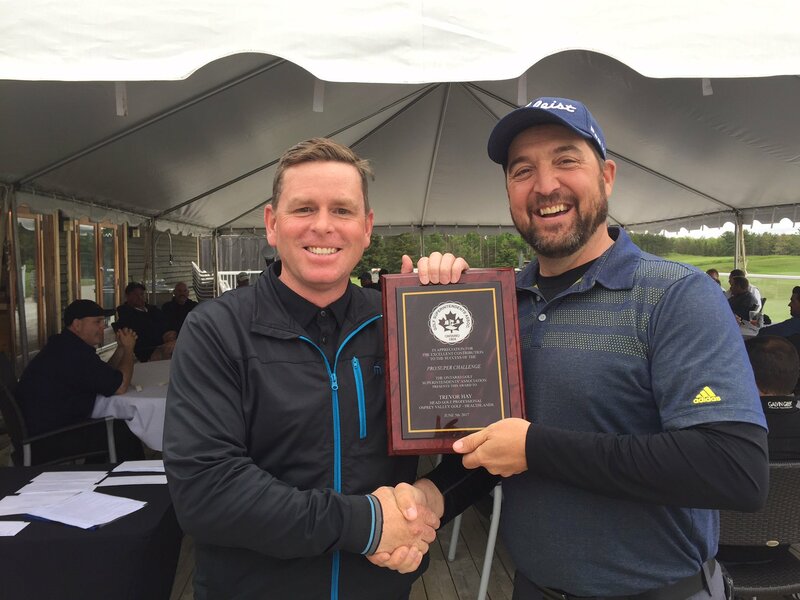 Trevor Hay (Golf Profesional) from Osprey Valley Golf - Heathlands, receives a plaque from Mark Prieur (OGSA Past President). 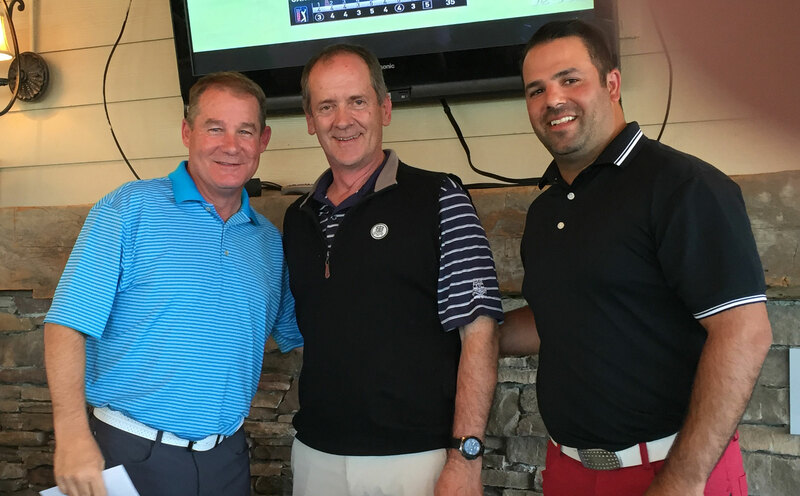 The 1st Place Pro/Super Team - Superintendent, Richard Butler (L) and Golf Professional, Brent Goodman (R) of St. Andrew's East Golf Club. 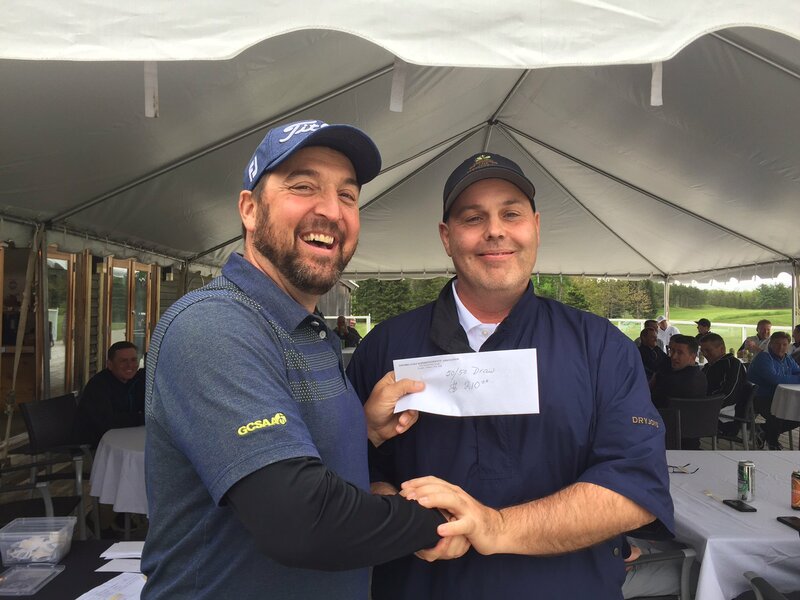 Sean Gunn, Superintendent from The Country Club, accepts a cheque for winning the 50/50 Draw. 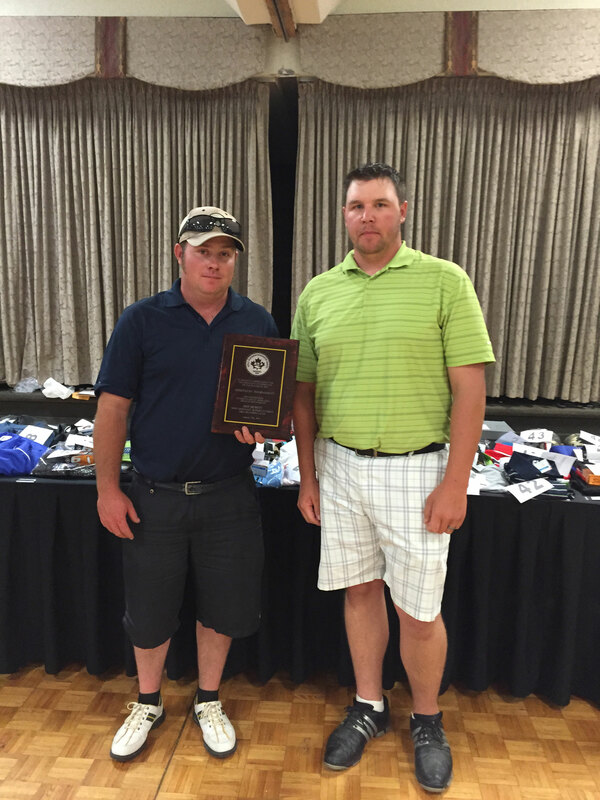 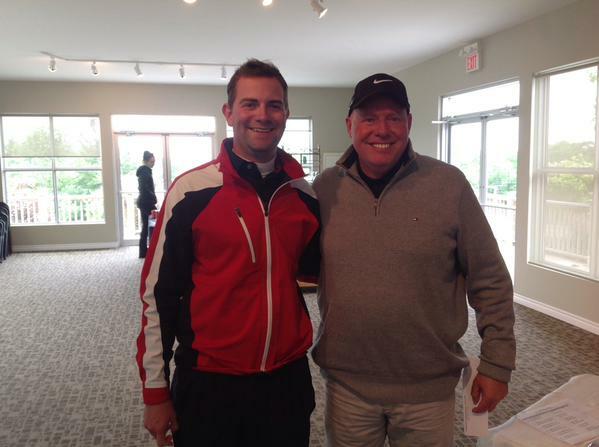 Superintendent Chris Andrejicka (right) receives a plaque from OGSA President Cory Janzen for hosting the event. 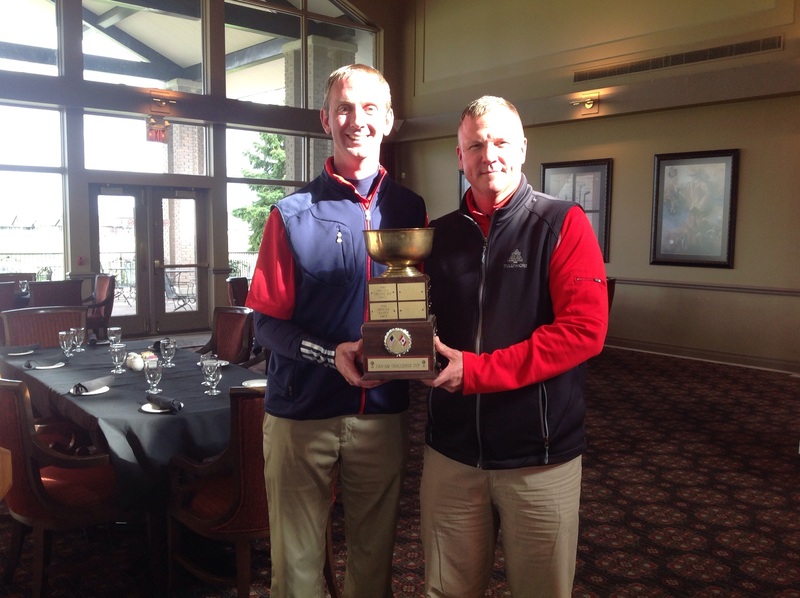 MiGCSAA Vice President Dan Dingman, (right) and Gregg Matthews of Turf Fuel of the U.S. posing with the cup after the U.S. won the CAN/AM Challenge. 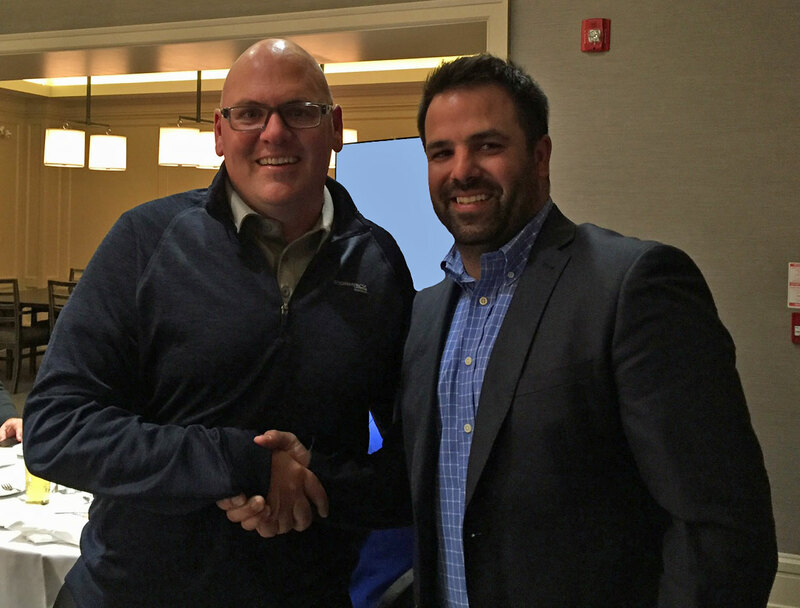 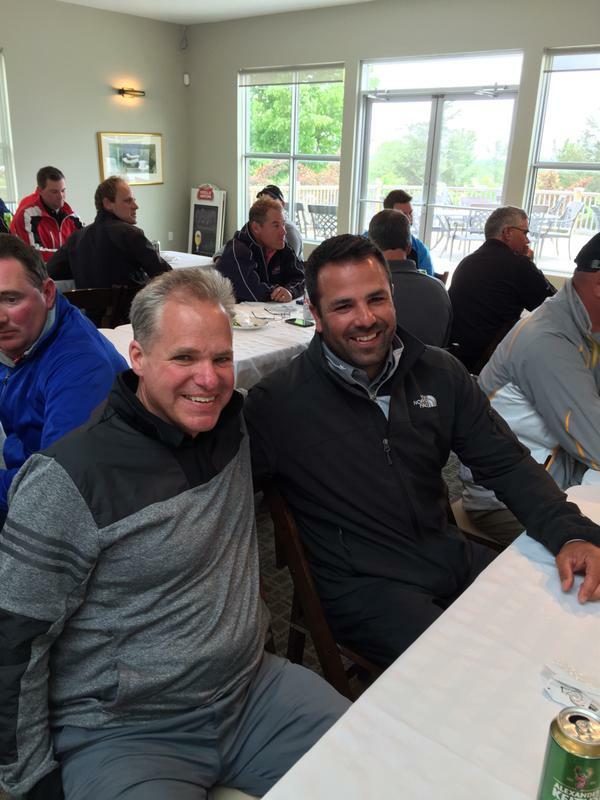 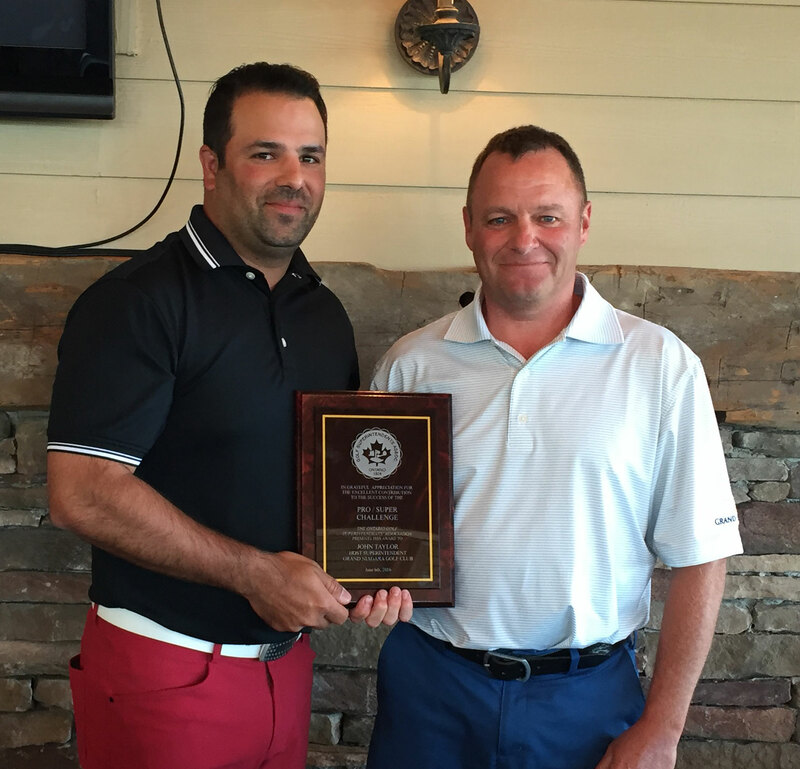 Superintendent Blair Rennie (right) receives a plaque from OGSA director Andrew Lombardo for hosting the event. 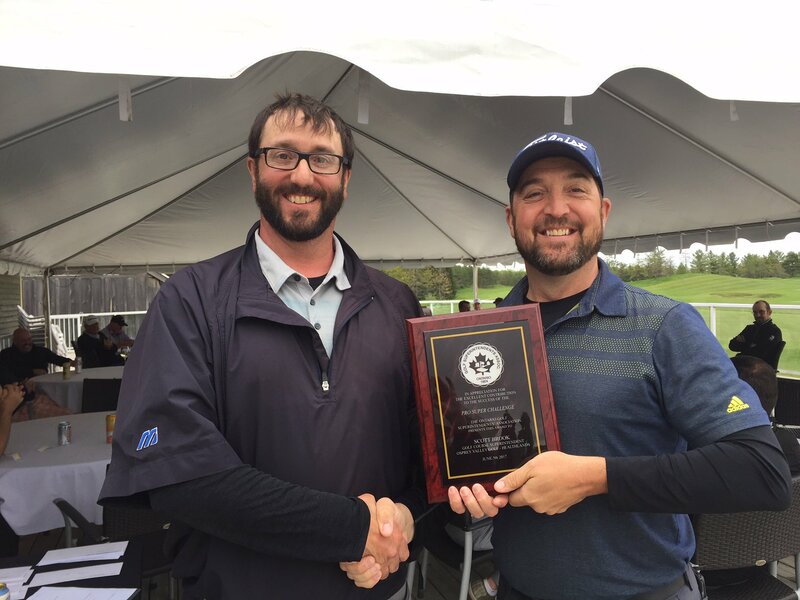 Robert Ackermann (left), Superintendent at Weston G&CC, recieves the George Darou Trophy, and a Toro snowblower, presented by Bill Martel of Turf Care Products. 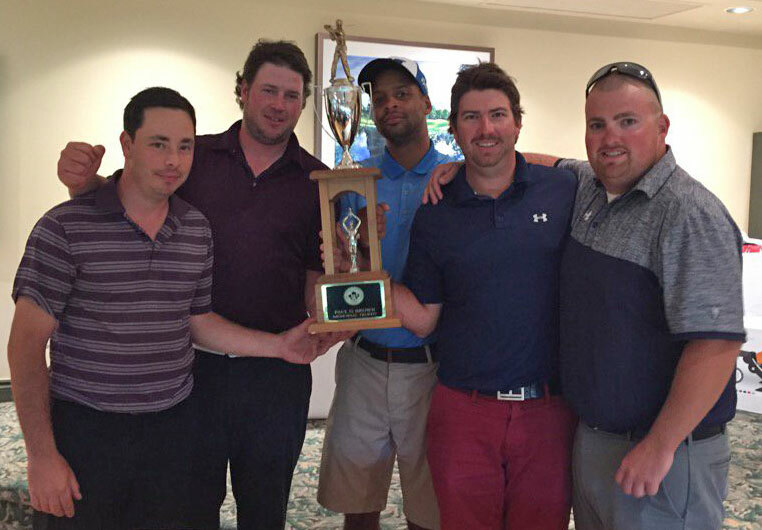 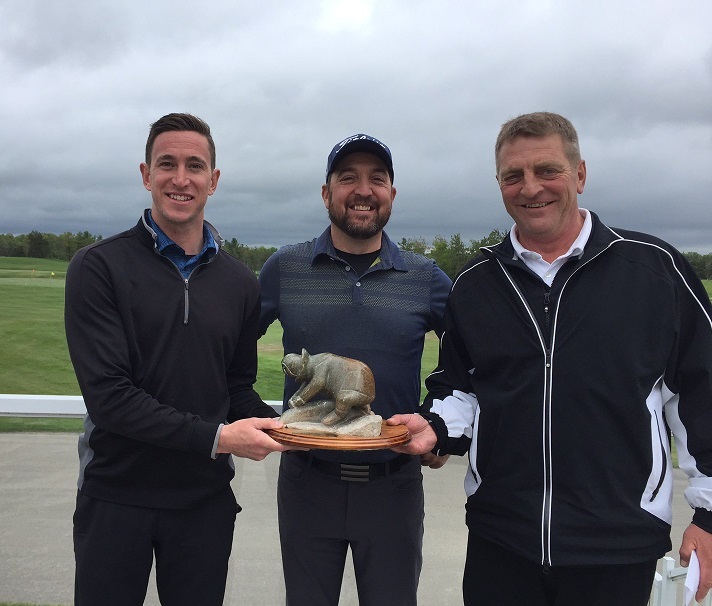 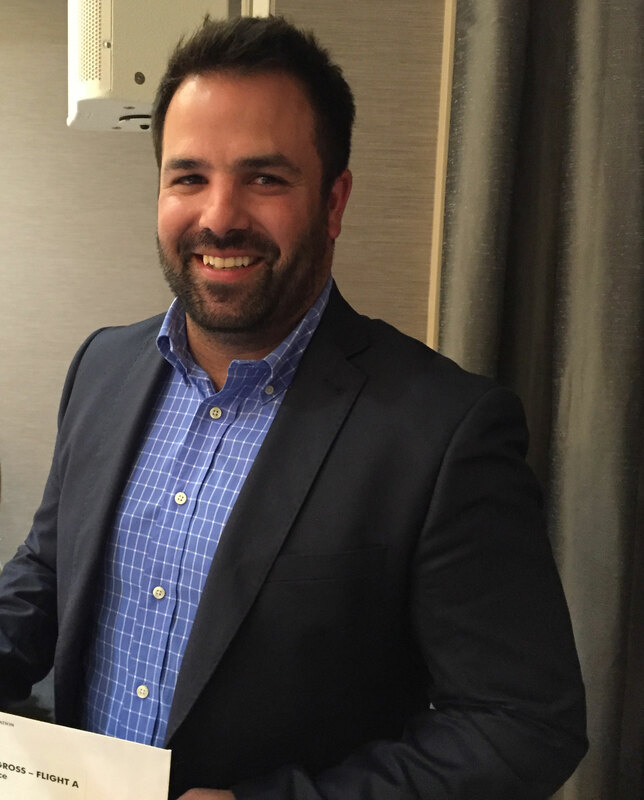 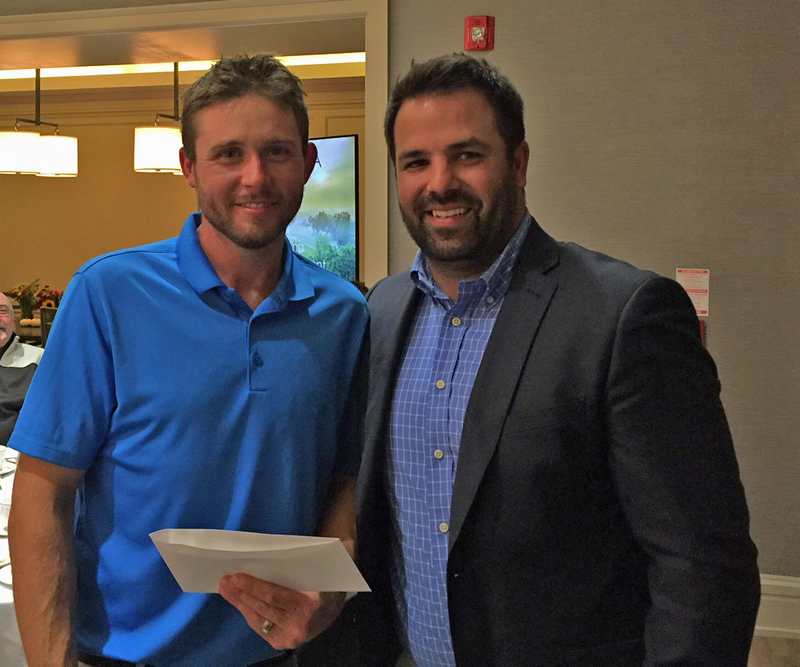 Kyle Young (left) of Whitevale GC, wins Low Net - Flight A.
John Alpaugh (left) of Allturf Ltd, wins Low Gross - Flight B.
Scott White (left) of Ontario Seed, wins Low Net - Flight B.
Andrew Lombardo of Wyndance GC wins Low Gross - Flight A. 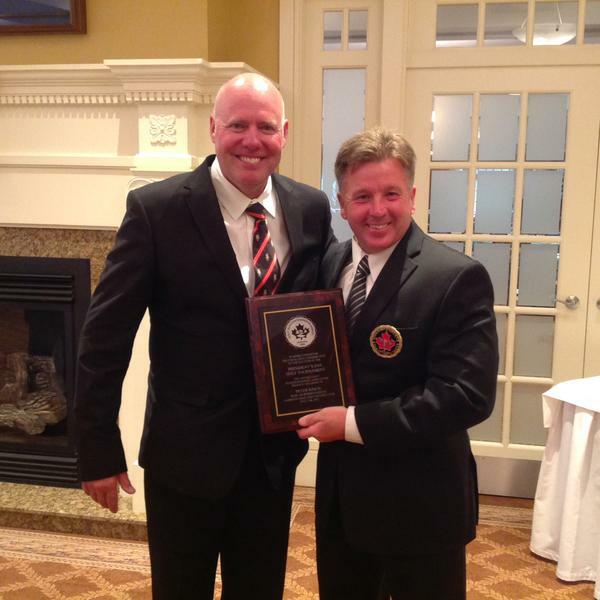 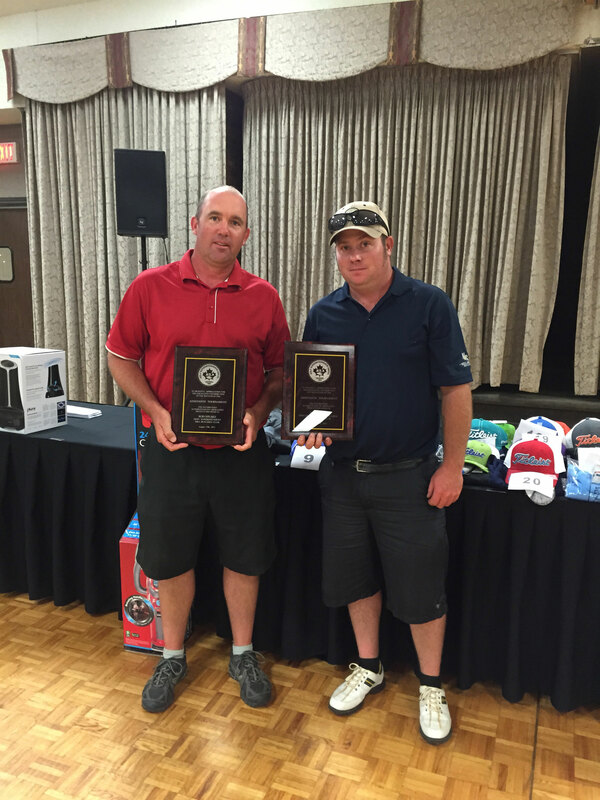 Host superintendent Paul Evenden (left) receives a plaque from the OGSA in appreciation for holding the event. 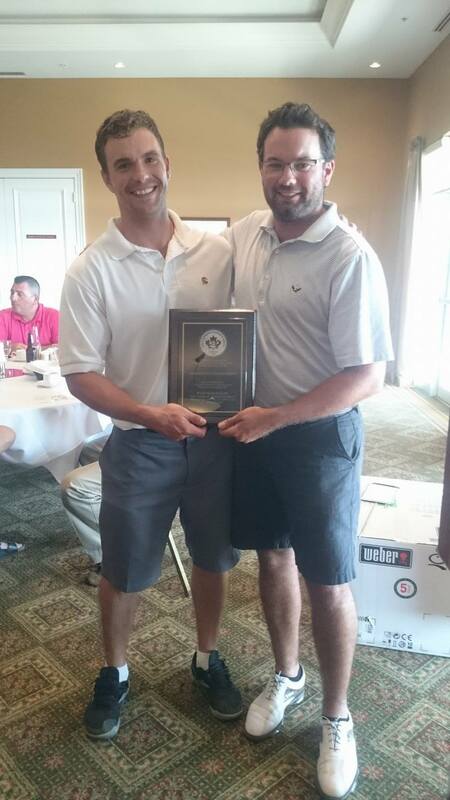 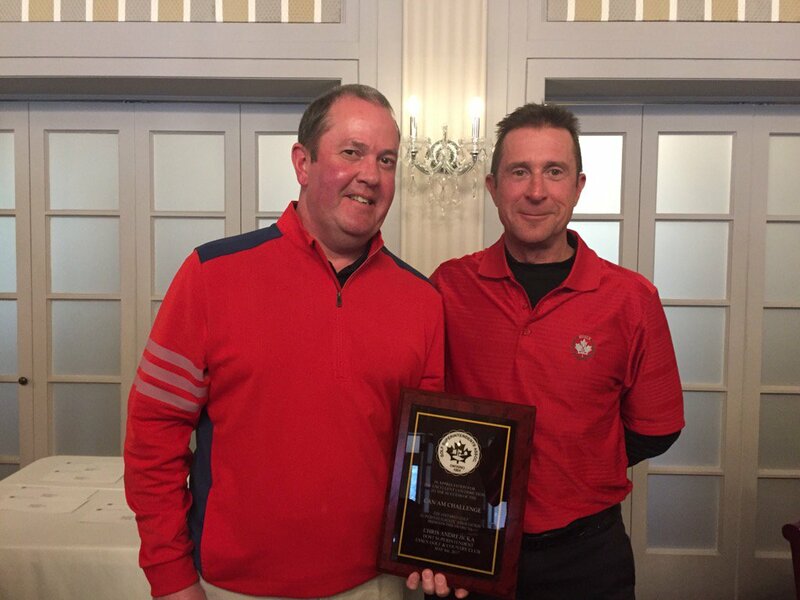 Host Assistant Superintendent Ryan Marangoni (left) recieves a plaque from Stephen Hicks, Assistant Superintendent from Dundas Valley Golf & Curling Club. 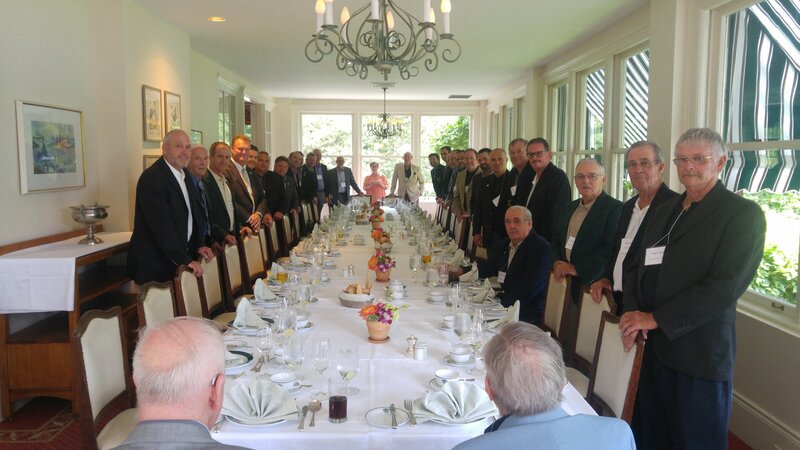 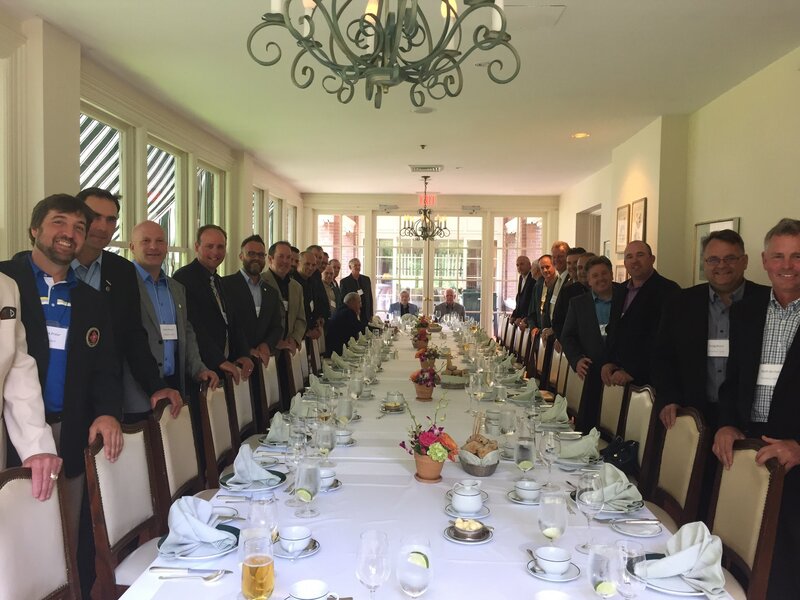 Lunch with OGSA Past Presidents and current Board of Directors at the Toronto Golf Club. 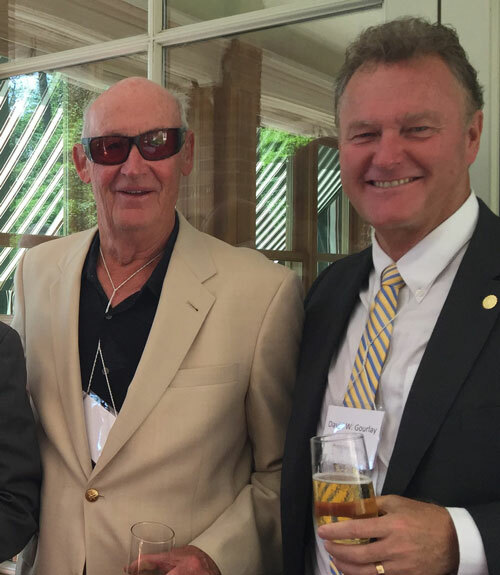 Stuart Mills (1979), Ken Nelson (1981), Thom Charters (1988), and Bob Heron (1974). 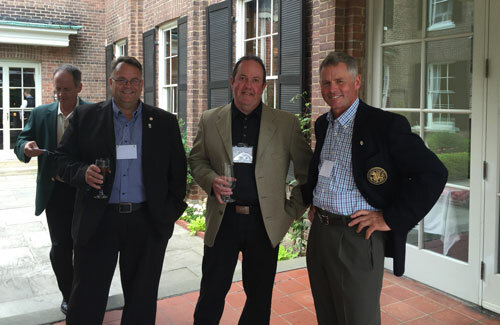 Doug Breen (2012), OGSA Secretary Treasurer, Cory Janzen and Keith Bartlett (2000) and just arriving, Rhod Trainor (1992). 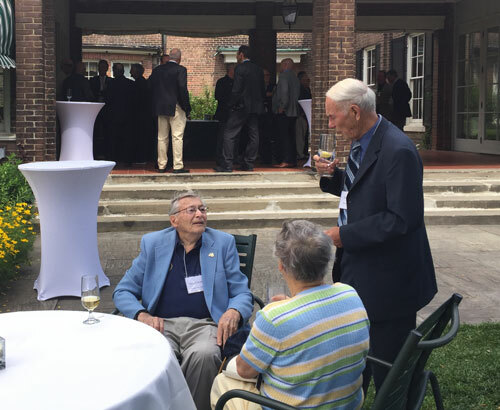 Robert Moote (1967) speaking with Alan Beeney (1977) as Joan Arends looks on. 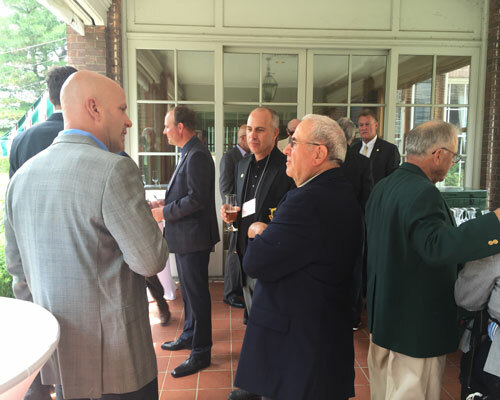 Sharing a moment on the breezeway at Toronto Golf Club. 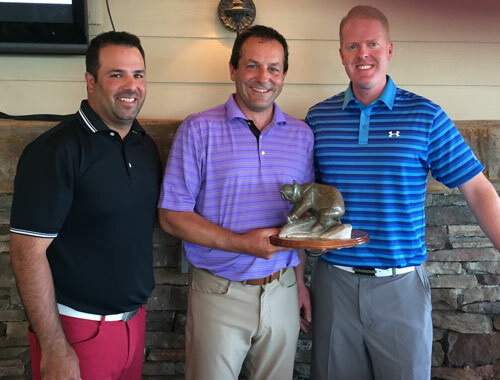 OGSA Director Andrew Lombardo (Wyndance Golf Club) congratulates first place winners Jason Hanna (Superintendent) and Adam Cherry (Pro) from Credit Valley Golf & Country Club. 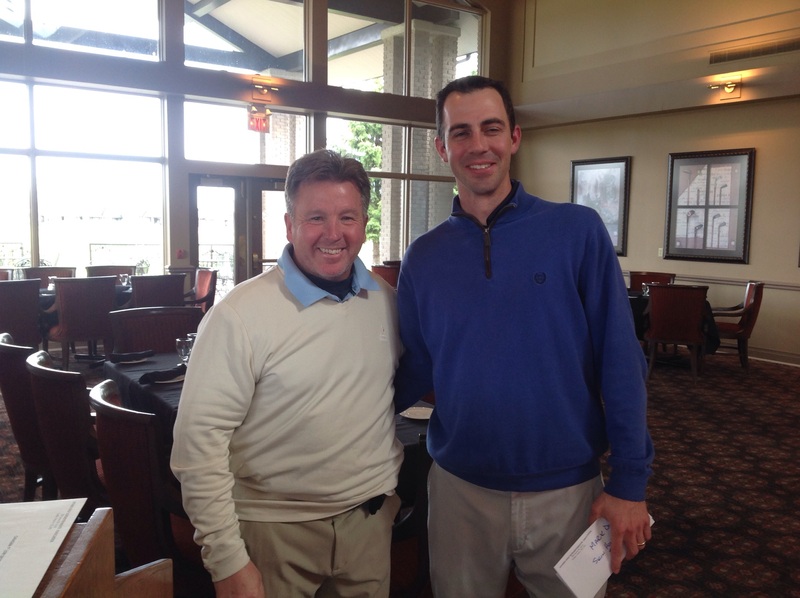 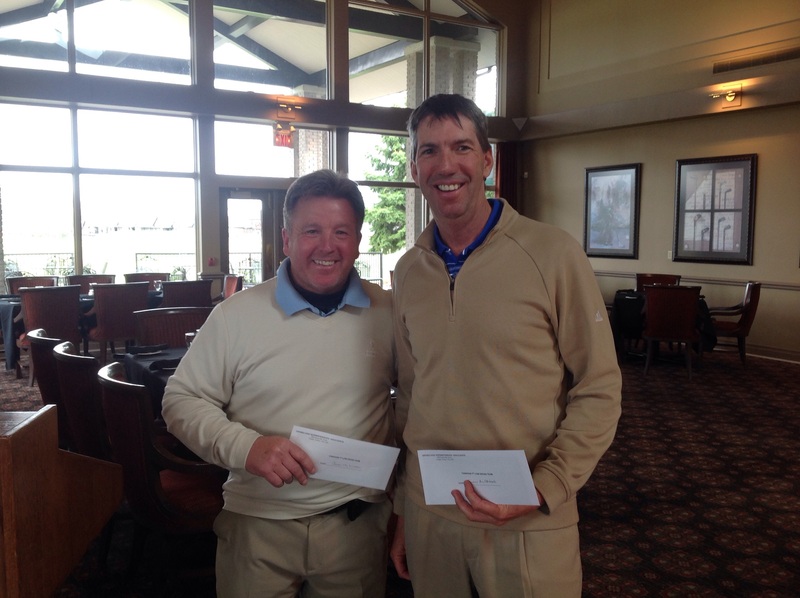 Second place winners David Miller (Pro) and Rhod Trainor (Superintendent) from Hamilton Golf & Country Club. 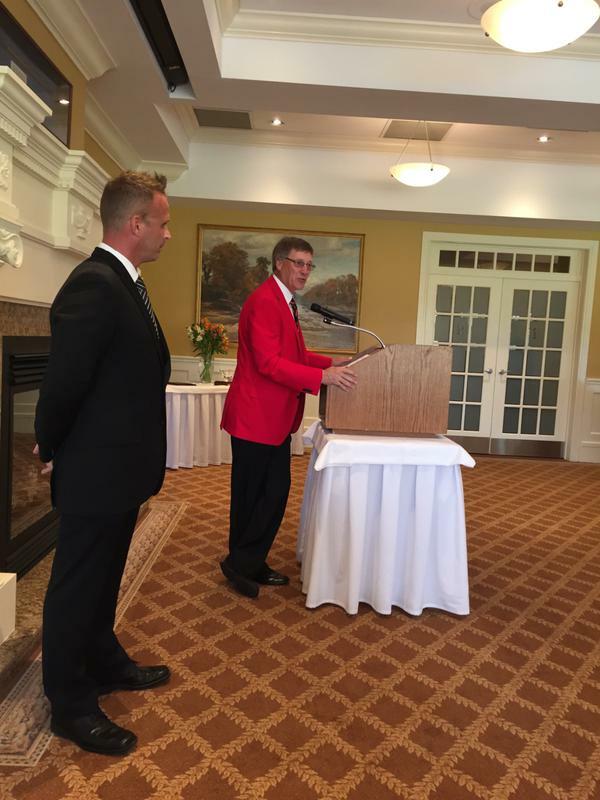 John Taylor (Superintendent) receives a plaque for hosting the Pro/Super Challenge at Grand Niagara Golf Club. 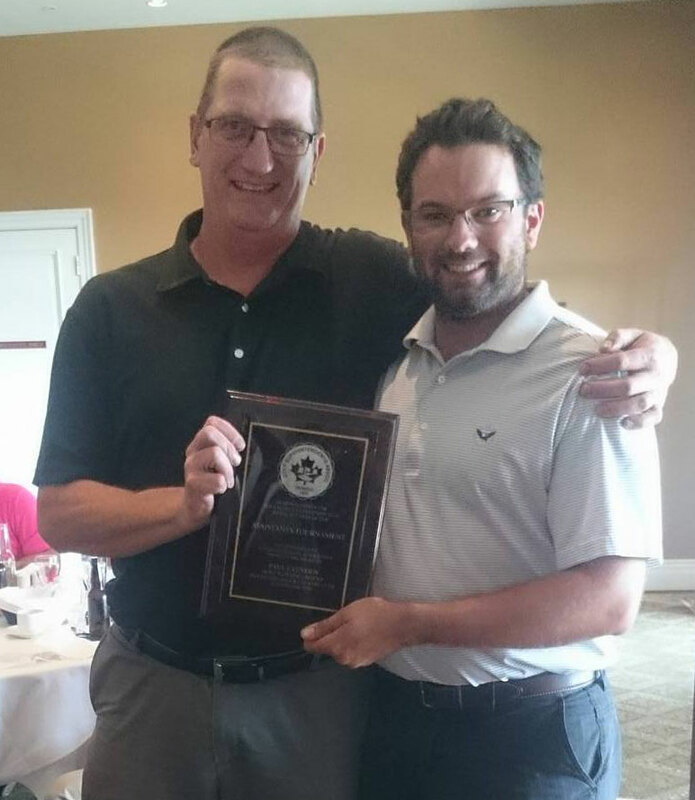 Bob Culig (Pro) from Grand Niagara Golf Club receives a plaque from Andrew Lombardo (OGSA Director). 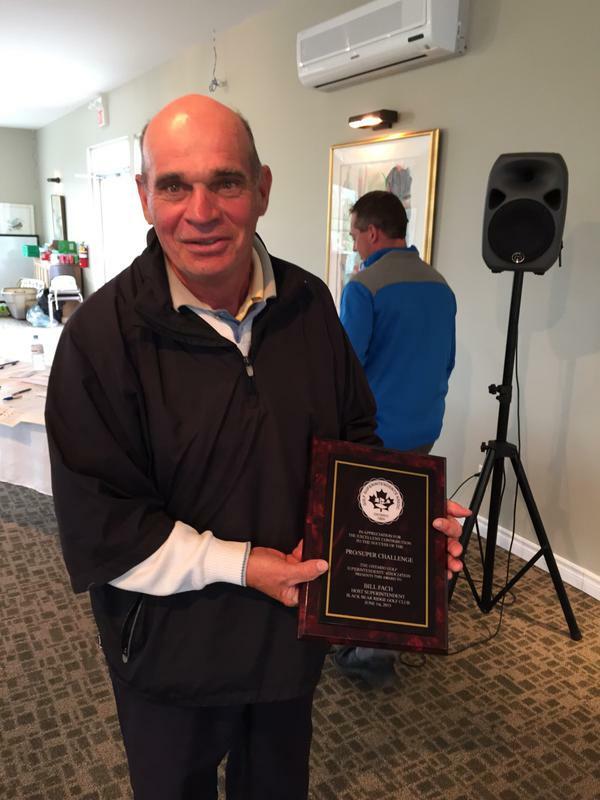 Host Superintendent Russell Owen receives a plaque from the OGSA. 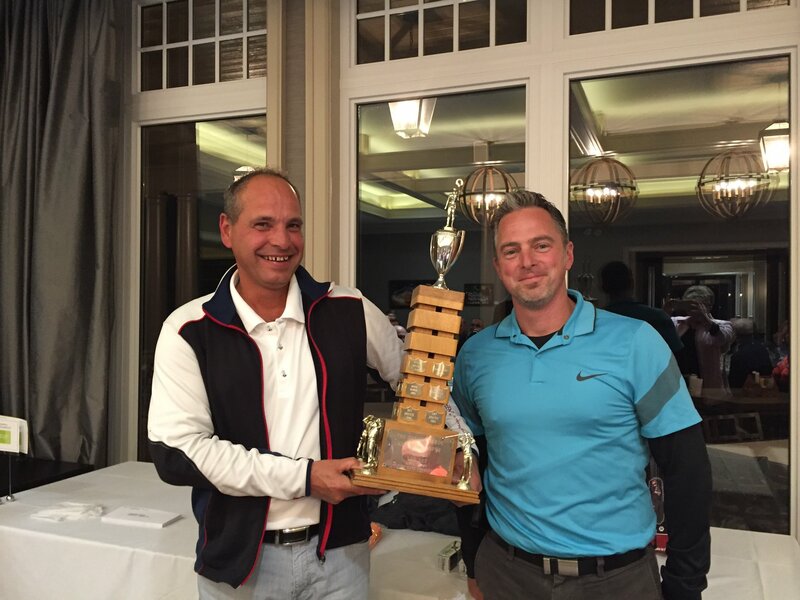 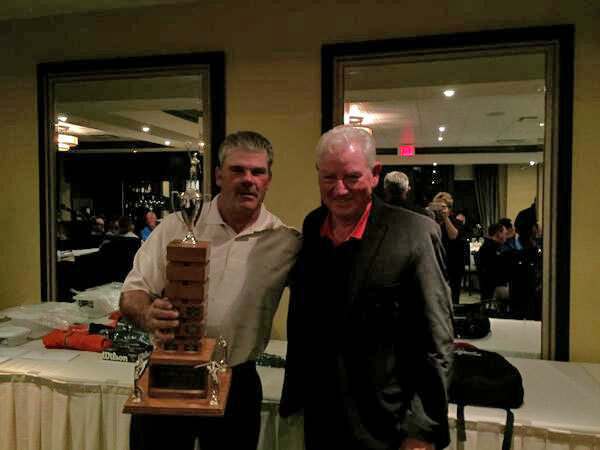 Winner of the George Darou Trophy, Duane Schmitz of Woodstock Meadows GC with Ron Craig of Turf Care Products. 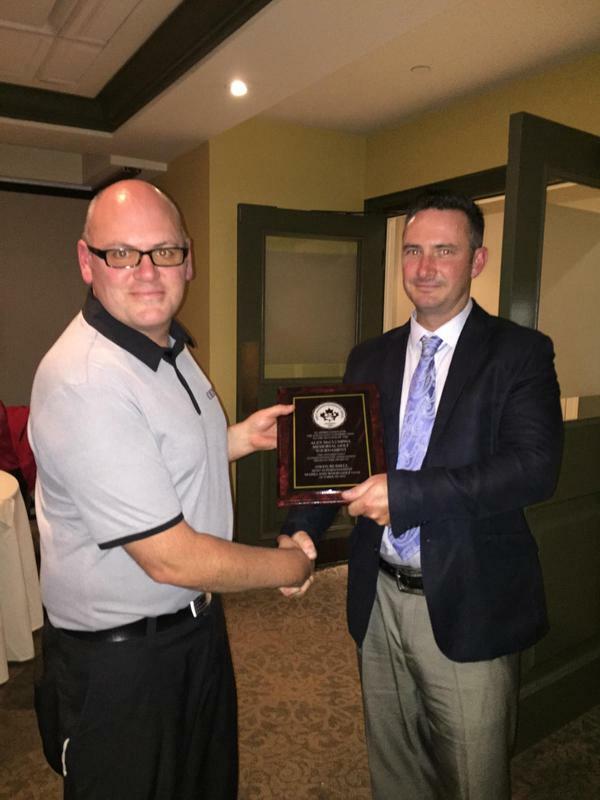 Host Assistant Superintendent Jeff Hewitt, receives a plaque from Ken Tilt of Trafalgar Golf & Country Club for holding the Assistant's Tournment at Mill Run Golf Club. 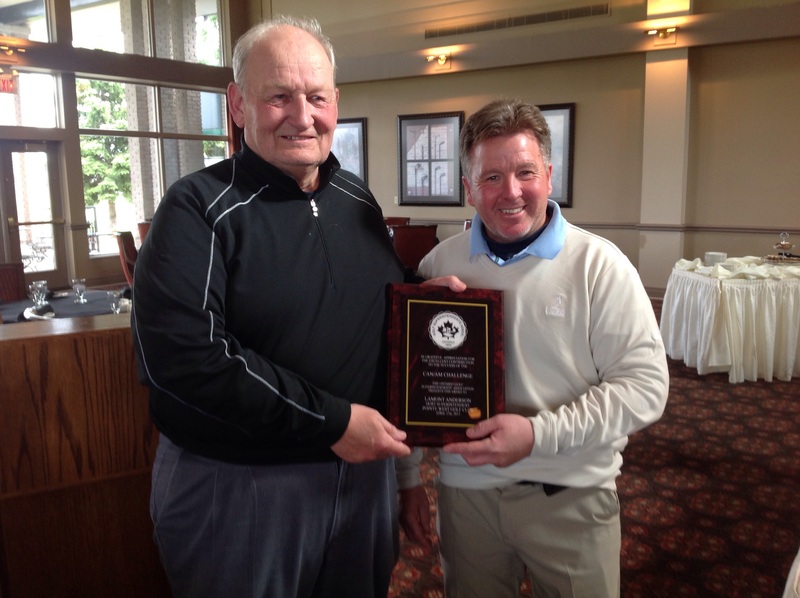 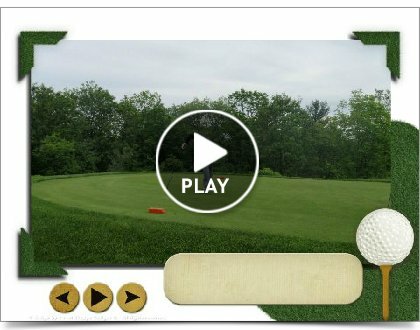 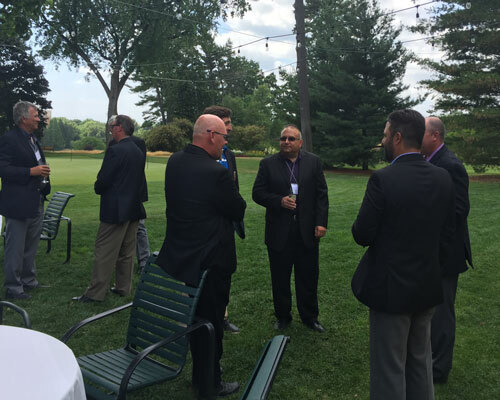 OGSA President John McLinden and John Alpaugh of Allturf Ltd.